Anna Hájková is associate professor at the University of Warwick. Her monograph, The Last Ghetto: An Everyday History of Theresienstadt, is forthcoming with Oxford University Press. Together with Maria von der Heydt, she cowrote a English and German book on the Veit Simon family, class, gender, and the Holocaust. 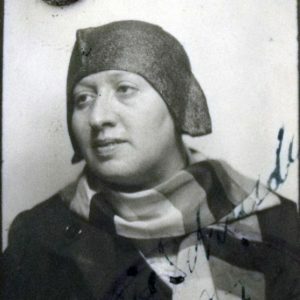 She also edited to family wartime diaries from the Communist resistance in the Holocaust, Čekám až se vrátíš: Rodinné deníky z války (I Wait For You to Come Back: Family Wartime Diaries). Her article “Sexual Barter in Times of Genocide“ was awarded the Catharine Stimson Prize for Outstanding Feminist Scholarship in 2013. She is currently working on two projects: a study of transgressive sexuality in the Holocaust, for which is writing a trade book on the Neuengamme guard Anneliese Kohlmann and queer Holocaust history. Moreover, she is also working on a generational history of a Communist generation in Central Europe, 1930-1970. Martin Šmok is senior international program consultant at USC Shoah Foundation as well as documentary film maker and independent researcher. Besides authoring two major documentary film trilogies examining modern history of Czechoslovakia, Among Blind Fools and Between a Star and a Crescent, Smok also curated exhibitions examining the same subject: Hagibor – the place and the people, about the Hagibor location in Prague, installed on the site of a concentration and later internment camp in Prague, 105, about propagandistic work of Boris Jefimov, Stalin’s favorite cartoonist, on the occasion of his 105th birthday, Shattered Hopes about the history of postwar return, migration and emigration of Jews through Czechoslovakia in 1945 – 1953, Stranded in Shanghai about the Czechoslovak refugee experience in the Hongkew ghetto, Through the Labyrinth of Normalization – Jewish Community as a Mirror for the Majority Society about the situation after the invasion and occupation of 1968, or The Jewish Community in Prague since 1945 until the present time, a permanent exhibition installed in the Jubilee synagogue in the Jerusalem street. He also authored a book researching Jewish traces in Prague Vinohrady, publishes various articles and cooperates with institutions researching similar topics. Together with Anna Hájková he founded Marie Schmolka Society.